RASI (Regional Air-Sea Interactions) provides remote access and browsing of a climatology of gap wind and coastal ocean upwelling events detected by an automated intelligent algorithm developed as part of the DISCOVER project, funded by the NASA MEaSUREs program. Users may browse the detected wind and upwelling events using the calendar-based View Events option on the menu to the left. To view or download the climatology data, users may use either the Get or Plot Data application on this site or download the original data files in the GHRC data center. Documentation on the details of the algorithm and approach is also available. 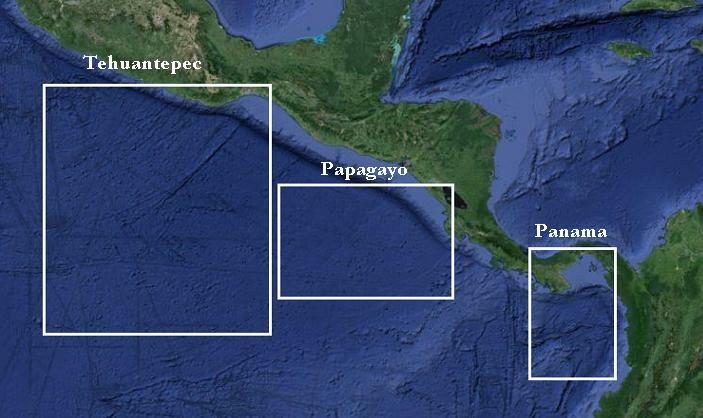 This map shows the three sites located in Central America which were used for this initial study. Winds blow to a lesser degree through the Panama Canal area and out over the Gulf of Panama. Below is a map showing other sites that experience regional wind jets and associated upwelling. We will use the algorithms developed for the Centeral America sites to detect the winds and SST upwelling in these other locations. The interaction of summertime easterly trade winds with the elevated topology of the Hawaiian islands (the major Hawaiian Islands generally exceed 1 km in height) results in wind jets that blow between and around the islands. These jets can generate associated SST upwelling. The high topography of Greenland results in a number of orographically induced high wind speed flows along its coast that are of interest from both a severe weather and climate perspective. The tip jet phenomena stand out as the most distinctive feature of the surface wind field during the winter months. 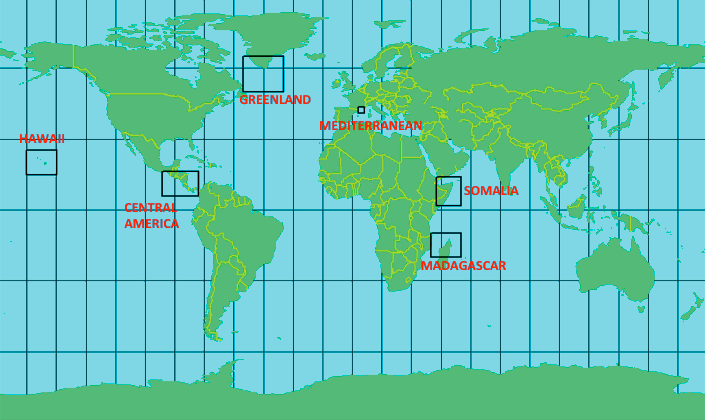 Peak surface wind speeds associated with these phenomena can be as large as 50 m/sec. The Greenland tip jet can flow in both directions, eastward and westward (known as the reverse tip jet). The mistral is a strong north or northwest regional wind caused by air funelling through the narrow Rhone Valley in France. The cold, dry winds blow offshore out into the Mediterranean Sea between Corsica and the Balearic Islands. Wind speeds often exceed 80 km/hr and can blow for days, usually during the winter and spring. The Somali Jet (sometimes called the East African Jet) establishes itself along the eastern coast of Somalia during June-August and forms part of the southwest monsoon that transports moist marine air toward India. The onshore winds north of Madagascar are blocked from moving inland by Somalia's elevated terrain, which forces the winds to flow northward along the coast. Winds of the Findlater Jet, an important part in monsoonal circulation of the Indian Ocean basin, are blocked by the high mountains of Madagascar and subsequently blow around the island. These redirected winds accelerate around the tips of the island and produce tip-jets, with a stronger jet at the northern tip. Please send questions or comments on this effort to support-ghrc@earthdata.nasa.gov.